The World Scar is a location in the DLC: Scorched Earth. This Wyvern-filled trench is where players can find Wyvern Eggs, which will allow them to raise their own Wyverns. When traveling in The World Scar, various recesses can be found in the wall, some of which will contain a nest with an Egg. The element of the Wyvern within can easily be seen from a distance based on the Egg's color - red for fire, blue for lightning, and green for poison. Once an egg is taken, any nearby Wyverns will immediately become aggressive towards the player that took it. 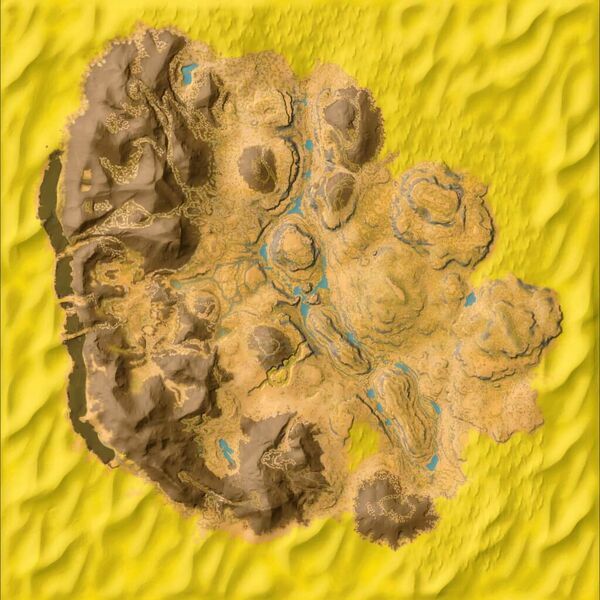 The World Scar lies to the far west of the Desert Map as a treacherous chasm between the mountains and the sand dunes. Also nearby are the Red and Blue Obelisks. The World's Scar possesses large quantities of both crystal and metal ore, should one be daring enough to farm it. The crystal nodes drop over 150 crystal, base gathering, per node. Metal spawns in extremely large clusters of both high density and normal density with up to 20 nodes in reach of each other at once! A recommended farming method would be to clear out the area by stealing an egg and farming the open resources. For more risky players, perhaps just keep an eye out for approaching Wyverns? Both desert cloth armour, or improved ghillie armour, alongside 30+ fortitude will be required to withstand the heat long enough to farm the materials. This goes without saying one should bring reserves of water as temperatures rise to approximately 60 degrees C, and about 100 degrees C, during a heatwave. The World Scar is loaded with Wyverns, on the far side of a mountain somewhat near the Deserted Town featuring the Manticore statue on the arena. The World Scar can be found at 75 degrees Latitude, 25 degrees Longitude, and is easily identifiable by the columns of black basalt around the outside of the trench, and glowing river of lava at the bottom of the chasm. Be cautious. Wyverns are extremely aggressive, and Alpha Fire Wyverns appear to spawn in the trench, and as such, they will boost the attack and aggression of all nearby Wyverns. Again, proceed with extreme caution, with a fast, high Stamina flyer in case you come across such an Alpha. The closer the player is to the lava river, the hotter the canyon becomes (~60 degrees C at the bottom during day time). Take care to manage one's heat insulation while exploring. It cannot be stressed enough to stay away from groups of lightning wyverns, even if server settings are boosted, those guys will knock out your flier fast without hesitation; in groups of three or more lightning wyverns, you might as well run unless you have your own to negate the topor. Alpha Wyverns can also have eggs in nests, This could net you bright red or albino fire wyverns when they are grown. During Superheat, the trench temperature during the day can reach extremely high temperatures of 200 degrees F (~100 degrees C) If you don’t want to be boiled alive, stay away when your Jerboa starts to give the signs! If you are caught in the trench unprepared when one hits, say your prayers, as the health drain is so fast you’ll die in under a minute. Bits of the Trench “biome” is randomly dotted in a few places in the dunes, but the spots are so small that no wyverns will spawn from them, however the temperature is the same as the World Scar. The World Scar from above. This page was last edited on 14 March 2019, at 21:52.